Scott Roofing is currently heading into their third season since inception, and things show no signs of slowing down. Scott Landru, the owner/operator of Scott Roofing, had previously worked for Helgason Roofing until the owner retired and from there, decided that he wanted to give business ownership a go. In doing this, Landru offered all of the employees a position within his new company and was pleased to be able to provide the same hard workers and the same quality of work that people had been used to with Helgason Roofing. “Scott was very happy there and it was a business that had been around for many years, so they were quite established in the area. He basically took that business and remodeled it into the business that we have today,” Landru’s wife Leslie explained. 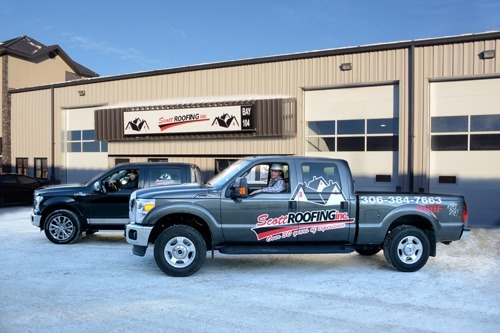 With over 20 employees from Saskatoon and surrounding areas, one of the things that the Landru’s are pleased with is the fact that many of their employees have made a career at Scott Roofing. “We have many workers that have a lot of years of experience under their belts. When they start with us, they begin as a labourer and then work their way up through the years. We are proud to have so many long-term employees and between them all, we have over 220 years of experience,” Leslie explained. At Scott Roofing, they offer a variety of services for both residential and commercial such as new installations, repairs, re-roofs and roof inspections. “I believe that one of the biggest reasons as to why Scott has been successful throughout the years is because of the fact that he has so much experience and he is very knowledgeable when it comes to what he does,” said Leslie. One of the areas where this knowledge comes in handy is during storm season when people’s homes are hit with hail and high force winds, which can cause major damage to roofs. Scott has worked with many insurance companies over the years and works hard to ensure that property owners receive the help they need during these times. As a member of the Better Business Bureau and the Saskatoon & Region Home Builder’s Association, Scott, Leslie and all of their employees are proud to represent the business and always ensure they do the highest quality of work possible. This also includes using only the best quality of products available, ensuring that customers receive the most durable and longest lasting roofing possible, especially with the unpredictable weather that we have in Saskatchewan. Customers of Scott Roofing also support the local economy, as they believe in using shingles supplied by Saskatoon companies. Products come with a 40-year warranty, and shingles provided come with a limited lifetime warranty. 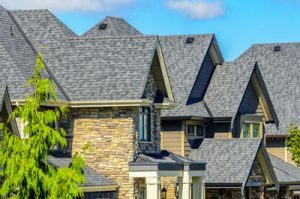 “Our professionals are very knowledgeable about the roofing materials we use and can provide expert advice and recommendations on the best type for your roof.” This is done by using factors such as the customer’s location, type of roof, and more to determine the best roofing material to use for their home or business. For more information, visit www.scottroofingsask.com, call (306) 384-7663, or email scott@scottroofingsask.com.